The new browser wars on on. More than a decade after Microsoft killed off Netscape with Internet Explorer, competition in the browser market has never been stronger. Just last week, Mozilla released Firefox 3.5, which has now been downloaded nearly 14 million times. Earlier in June, Apple released Safari 4. In March, Microsoft introduced Internet Explorer 8, and Google came out with a speedier beta of its Chrome browser. Some early data is coming in showing relative market share and how fast people are upgrading. If you look at the chart above from Statcounter, it indicates that since March Internet Explorer has lost 11.4 percent market share to other browsers. [..] Where did that go? It went to Firefox, Safari, and Chrome. 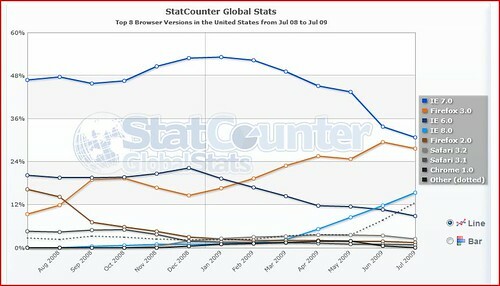 Nearly 5 percent of that, or about half, went to Firefox 3.0, which currently has 27.6 percent market share. That doesn’t count last week’s upgrade. Alas, as I pointed out in my essay a few weeks ago (“European Regulators Think Consumers Too Stupid to Know How to Download a Different Browser“), some Euro-crats still seem to believe that changing browsers requires great detective skills to unearth alternatives. It’s just pure poppycock and yet another sad example of how antitrust law is usually hopelessly behind the times and has absolutely nothing to do with protecting consumers or fostering innovation. Now, please excuse me while I get back to surfing the Net via Firefox and Chrome (and Opera on my mobile phone). My God, how did I ever find these browser alternatives! Next post: Three Cheers for Information Abundance!